Getting a good equipment fit for an operation can be a challenge, but Ontario logger Richard Robinson has found the right equipment balance, with a Neuson MHT 20-tonne tracked harvester with a LogMax 5000 head and a Rottne Rapid forwarder. Horsepower has a much different meaning these days for Ontario logger Richard Robinson than when his father was involved in the forest industry. Back then, his father Eldon, who was a farmer and a logger, was still using horses to move the wood, and the trees were felled with hand-cutters. Although Richard Robinson started out in logging the same way, it was not too long before he moved into using mechanized logging equipment. He's since gone through an evolution in the types of logging equipment in his almost three decades of being in the business. One thing that has been constant, however, is that he is always searching for the equipment that works best in the county-owned land and private wood of southern Ontario, where he operates. Robinson needs just the right balance of equipment--including the right horsepower, in terms of engine size--in the predominantly red pine plantation forests he harvests in southern Ontario. It's a balance between having nimble enough equipment to maneuver between the evenly spaced rows of trees, and having the heft to deliver production. "If a piece of equipment is too big, we can't get it between the rows," he says. "But it can't be too small because it has to deliver the volume to justify the capital that we've invested in logging equipment. You have to be able to cut a lot of wood considering the price of logging equipment these days." The current equipment balance for Robinson, and son Brandon, is a Neuson MHT 20-tonne cut-to-length tracked harvester, with a self-leveling cab, and a LogMax 5000 head, accompanied by a 12-tonne, six-wheel drive Rottne Rapid forwarder. Robinson was one of the first--if not, the first--to do cut-to-length wood in this part of Ontario. The reason, as usual, is simple: that's what his sawmill customers wanted. Most of Robinson's logs go to Brouwer Wood Products of Keswick, an eight-foot mill. They're looking for logs from five inches up to 16 or even as large as 18 inches. Larger wood goes to various mills in the area. They do some harvesting for poles, as well, that go to Northern Pressure Treated Wood of Kirkland Lake, for pressure treating. Not only does the equipment have to deliver the wood, it has to be able to deal with a variety of terrain. Robinson says they are generally working in gently rolling hills around this part of Ontario. But he adds that from time to time, they do a fair bit of work around Port Hope and in the Ganarska Forest, a 10,400 acre conservation forest that straddles the Counties of Northumberland, Peterborough, Victoria and the Region of Durham. "It can get pretty hilly around there. But we're well set up to handle that kind of ground with the tilting cab on the harvester." The tilting cab was one of the features that drew Robinson to the Neuson MHT harvester. "It really is good to have, especially in that kind of ground." The unit comes equipped with a John Deere engine, putting out 167 horsepower. The LogMax 5000 head goes well with the MHT, and the Rottne Rapid, in turn, is a good match with the harvester he notes. "It's a good combination of equipment for us." The Rottne forwarder was purchased a little over two years ago, and it has delivered solid performance. "We've had a few minor problems, with wiring and electrical parts, but overall it's been a pretty good machine." Both the MHT and Rottne perform well in the generally sandy soil of the region. They use ECO-Wheel Tracks from Olofsfors Inc. to keep the machines moving during the winter months, with the tracks usually going on around November. "They're perfect in the kind of weather we see in this part of Ontario. They help to keep us up and out of the snow." 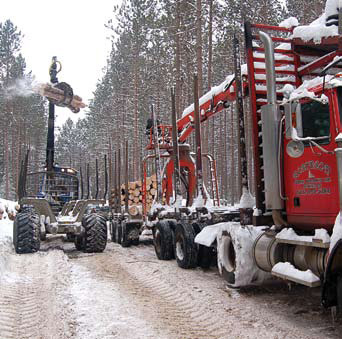 The logging operations for Robinson Forest Products are close to mill customers, which is usually in a 150-mile radius of their home base in Stirling, just northwest of Belleville, about 200 kilometres east of Toronto. The operation moves around a fair bit with its harvesting sites. But Robinson noted that they can sometimes be in one spot for a good stretch during the winter months. "Being in one spot for a couple of months is pretty good. But at the other times of the year, we could be moving two or three times a month." That's why a large float is on his equipment shopping list--the equipment is too high to go on his current float. When they are moving to a new area, they try to make it worthwhile, and generate some additional business. "What we try to do is get a bit of quantity in an area. If we get a block in a certain area, there might be another block or two close by." They're also often approached by landowners, who might see the equipment working on adjacent land. "That helps to keep us busy. That harvester has a pretty good appetite for wood--we can cut 100 cords a day with the MHT--and we like to keep it busy." They work to stay close to their mill customers, which is usually in a 150-mile radius of their home base in Stirling, just northwest of Belleville, about 200 kilometres east of Toronto. "We basically go where the wood is. But you don't want to get too far away from your markets. With eight foot wood, there is a line on how far away you can go." That line can stretch a bit, if there's another mill in the region that is looking for word. "But you always to keep it in mind that the numbers need to work," added Robinson. Fuel costs are an increasing part of that numbers equation. With rising prices for diesel, it is taking a bigger bite out of operating costs, and of revenue. Robinson says their equipment line-up is reasonably good on fuel. The machines go through about 500 gallons every two weeks. "If the price rises five cents a litre, that still has a big impact over the course of a year." Aside from a larger float, a small dozer might also be added at some point to the operation, to help with building landings and trail, and to help put in the occasional bridge over a creek. "Once in a while we have to do some bridges, but the access is usually pretty good." While Robinson notes that the MHT and Rottne could certainly go to two shifts, they run them one shift, doing ten to 12 hours a day, usually setting aside half-a day on Fridays for maintenance. They do most of their own service, relying on the distributors, to handle the more detailed work. If they have problems, they are usually resolved the same day. Parts supply is reasonably good through the dealers, Agritibi and LogMax Inc, usually the next day. Generally, they are working fairly close to 12 months a year--with a bit of a lull at spring break-up. But Robinson notes it is a constant battle to find timber. "You're always looking for work, that's for sure. You're working on the next deal while you're cutting the last deal you made. We don't have any guaranteed cutting. With the tenders from the country, sometimes you get them, and sometimes you don't." Having been logging for such a long time in the region, they have built a solid reputation, and they do a fair bit of work on private land. They are sometimes approached by forestry consultants, acting on the part of landowners, but often they're talking directly to the landowners. "We've got a good name in the business," and that's key, he says. "There's quite a bit of private land around this area, and a lot of it needs to be thinned," he says. "Sometimes, we have someone go in and mark the trees, but if it's just straight row thinning, we just go in and do the harvesting." In the end, says Robinson, it's all about keeping the landowners--and, of course, their mill customers--happy. And overall, Robinson is happy with his current equipment combination. "There is equipment out there that is bigger, and it might have more features, but with our situation, we have to strike that balance--you can't have too big machinery and you can't have machinery that is too small." While it's currently facing challenges due to a downturn in the U.S. housing market, B.C. 's Port McNeill Shake and Shingle has found a solid business model working with salvaged western red cedar. Having the right combination of equipment--including an emphasis on Link-Belt machines--is helping B.C. 's Ironside Contracting keep their operations busy, and productive, in some challenging times. Tembec recently made a multi-million dollar investment to streamline its hardwood division facilities in Ontario, making the operation more competitive against offshore competition. 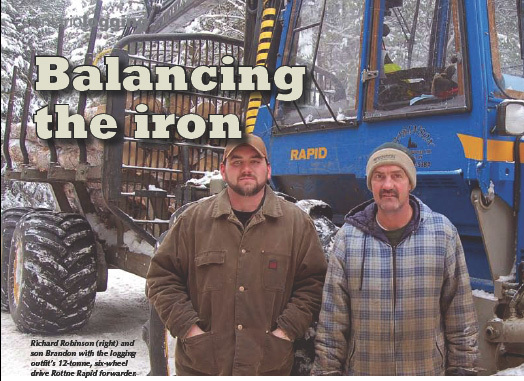 Finding just the right iron can be a challenge, but Ontario logger Richard Robinson has found a good equipment balance, with a Neuson MHT 20-tonne tracked harvester with a LogMax 5000 head and a Rottne Rapid forwarder. There's wood product and bioenergy potential in the fibre debris left over from mountain pine beetle harvesting efforts--and Pine Star Logging is tapping into that with a Bandit Beast 3680 mobile grinder. A BC company is using technology--involving hyperspectral imagery--to give forest managers a head's up on pine beetle activity, with the potential to curtail beetle spread. The Elmia Wood show in Sweden in June proved to be a success, despite industry uncertainties. Logging and Sawmilling Journal takes a look at some of the new iron that was unveiled at Elmia. Jim Stirling talks about how producing green energy from wood biomass in B.C. needs to overcome some bottlenecks.